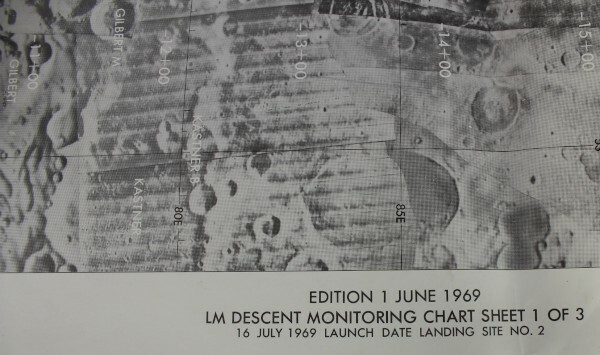 First edition of the Apollo 11 Lunar Module Descent Monitoring Chart, sheet No. 1 of 3, displaying the lunar terrain designated as landing site No. 2. It was prepared under the direction of the Department of Defense by the Aeronautical Chart and Information Center. 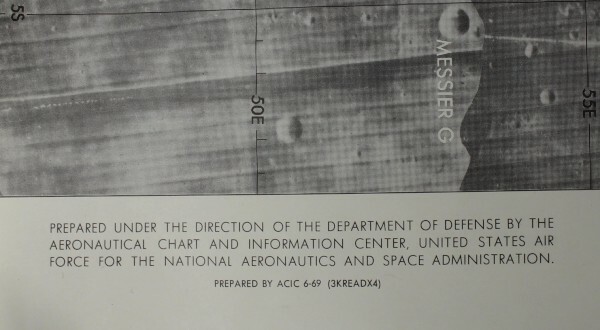 Photographic charts such as this were widely used by NASA to help prepare for each mission. The chart shows the ground track of the spacecraft as it orbited the Moon, over a detailed photographic montage of surface features. The chart helped to give an accurate prediction of where each Apollo spacecraft would be above the lunar surface and what features the crew would be able to see at specific times. The horizontal white line in the centre shows the time in minutes and seconds. 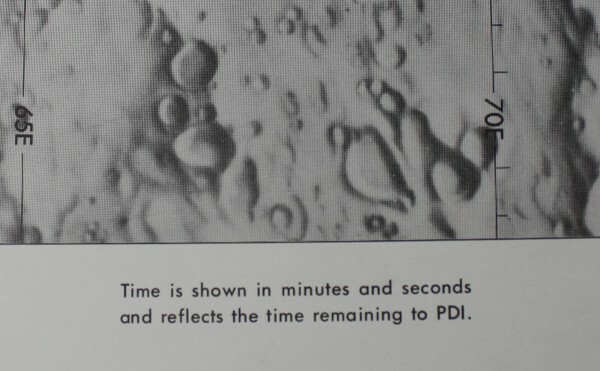 It reflects the time remaining to PDI (Powered Descent Initiation) which is the moment the Lunar Module’s thrusters are fired to assist the spacecraft's descent to the surface of the Moon. The site chosen for the first lunar landing, Mare Tranquilitatis, is a relatively smooth and level area. However, it does have a high density of craters, such as Banachiewicz, Jansky, Gilbert, Dubiago, and Langrenus, which can be seen on the chart. In the final moments of landing Neil Armstrong had to manually pilot the lunar module to avoid a crater.